Got a couple of hours to spend hiking in the Columbia River Gorge but don't want to fight the crowds at the busy trailheads? Head for the Pacific Crest National Scenic Trail in Cascade Locks. Nobody would think of hiking there, do they? Well, yes, of course, the PCT gets its share of hikers, but not nearly as many as at Multnomah Falls, Horsetail Falls, Wahclella Falls, Eagle Creek or any number of other nearby trails. The parking area for the PCT is just before the toll booth for the Bridge of the Gods, in a Columbia River Gorge National Scenic Area day use park with restroom building. If this small lot is full, there is plenty more parking just downhill off Wanapa Street beneath Bridge of the Gods. The PCT is well signed as it climbs the hill and heads away from the bridge's toll booth, passes under Interstate 84 and leaves Cascade Locks for the woods. The destination will be , two miles on the PCT, then another easy quarter mile on a well-marked spur. 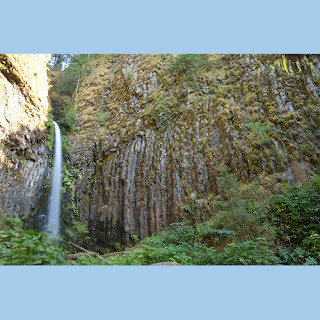 Despite the name, the falls runs year round and is quite scenic, set as it is in a bowl of columnar basalt. The 50-foot falls is especially pleasant when the heat of the day makes a little spray feel good. It got its name when the city of Cascade Locks used to take the water for its municipal system. You can turn this into a loop hike by continuing toward town on the old road that these days serves as the spur trail to the falls. Before long you reach city streets of Cascade Locks. It helps to know your way around town, but when in doubt, walk toward downhill the Columbia River until you get your bearings.